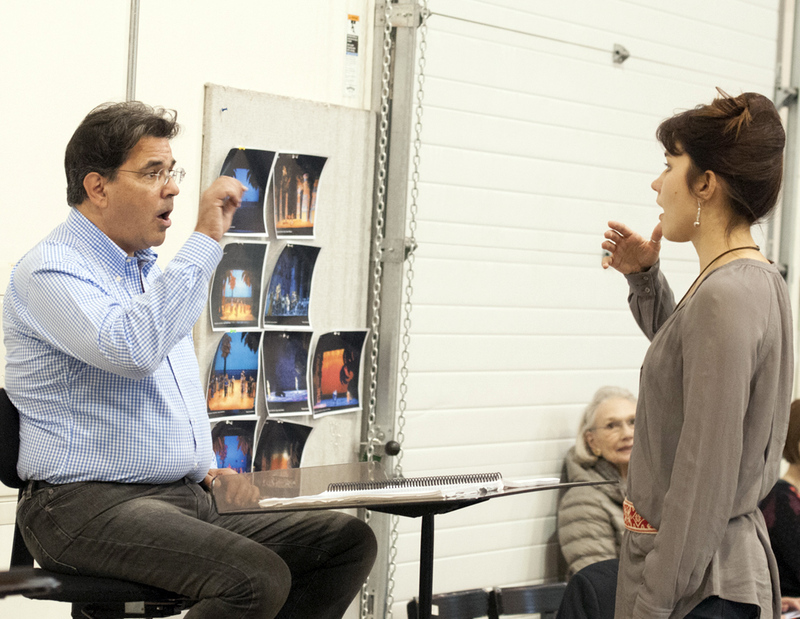 Listen, read, or download our latest podcast, in which Aidan Lang, Seattle Opera's General Director, introduces Bizet's youthful romantic fantasy, The Pearl Fishers. The show opens on October 17, 2015. Lang tells us about the exciting production coming to Seattle and shares his enthusiasm for this work, which has come back into fashion after a century of neglect. To make great opera, a producer must assign work appropriate to the skills, talents, and interests of the artists. Tell us a little about the team you’ve assembled for this production of The Pearl Fishers. 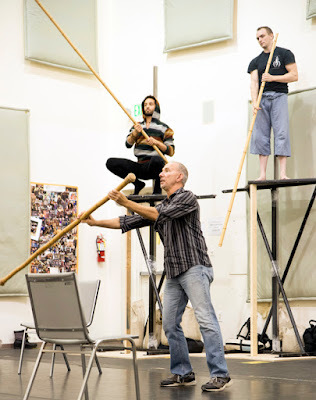 We had decided to present The Pearl Fishers, and it was a question of choosing which production to bring to Seattle. For me, there was really little debate. There’s a production which dated from 2005, from San Diego, directed by Andrew Sinclair and designed by Zandra Rhodes. What they have brilliantly done between them is find, for want of a better word, a modern take on the ‘exotic’ impact which this piece would have had on its audiences in Paris in 1863. Zandra’s a textile designer. She has translated that not only to wonderful prints and costumes, which give them life and movement, but also taken the same idea of using motifs for the scenery. She’s not the person to go to if you want straightforward realistic scenery. It’s stylized to a certain extent. We’re clearly in Ceylon, and we have trees and everything, but by taking a two-dimensional and very colorful approach, she’s reflecting the sort of scenery which would have been there on Bizet’s stage. Color is the key to this production. Loosely speaking, it’s coded; there are blues and green-blues for the pearl-fishing folk, while the priestesses and priests of Brahma are in reds, oranges, yellows. So it’s easy to identify who belongs to what camp. Rhodes’ vibrant use of color creates a visual impact akin to the spectacle which would be a part of The Pearl Fishers for Bizet’s audience. 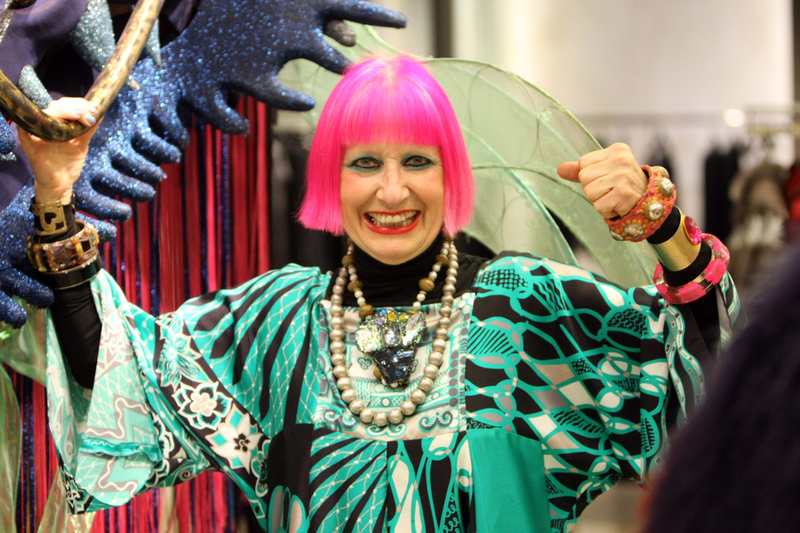 Zandra Rhodes is a figure who absolutely has been at the center of fashion in London for as long as I can remember. In fact, a little story: I had to do a costume element to my university drama degree. I was inept at sewing, and I failed lamentably to create a female costume for a Jacobean tragedy. So I was moved sideways to a student play called PUNK: Would You Let Your Daughter Marry One?” And of course Zandra Rhodes was dubbed “the Princess of Punk” in those late ‘70s, her use of safety pins, so in evolving these costumes for a student play, I was of course echoing Zandra’s work in a bizarre way! In terms of opera, The Magic Flute, which was in San Diego and then here, was her first opera, Pearl Fishers was her second. She likes an opera with an element of fantasy in it. She’s not going to design a piece set in a slum somewhere. 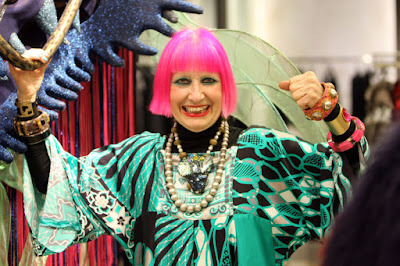 She wants something vibrant, that plays to the vibrancy of her designs. Andrew Sinclair and I go back a very long way, because my very earliest job was working on the Ring cycle at Covent Garden in the beginning of the ‘80s, and Andrew was one of my colleagues there. I remember talking with him at great length about Wagner. Andrew is actually Australian, although he’s been at the Garden for many, many, many years, and lives in London. And of course Andrew got to Seattle before I did; he did Marriage of Figaro back in 1989. And of course I’m doing the next Figaro, in a few months’ time, so there’s a nice bridge there as well. Dance is obviously a feature of nineteenth-century French opera. It was essentially mandatory to have a dance element, certainly at the Paris Opéra. And what Andrew has done is encourage dance, maybe more than we’re used to, to suggest the slightly primitive, tribal nature of this community, to add an element of excitement, an extra layer to some of the scenes which might otherwise appear somewhat static. So as I say this one was really the obvious production to bring. It’s been hugely successful, it’s played twelve times throughout the States since it was new. A couple of houses have done it twice, it’s been so popular. I think it really captures the essence of the piece, makes it appropriate to us today, and at the same time completely respects the background to the work and pays homage to its genesis in France in the middle of the nineteenth century. Our conductor, Emmanuel Joel-Hornak, again I’ve known a very, very long time. I gave him what I believe was his debut outside France when he was young—a production at Opera Zuid in Holland of Chabrier’s L’Étoile (a fantastic piece). It was directed by Christopher Alden, who’s coming to Seattle for The Flying Dutchman at the end of the season, and Emmanuel conducted. 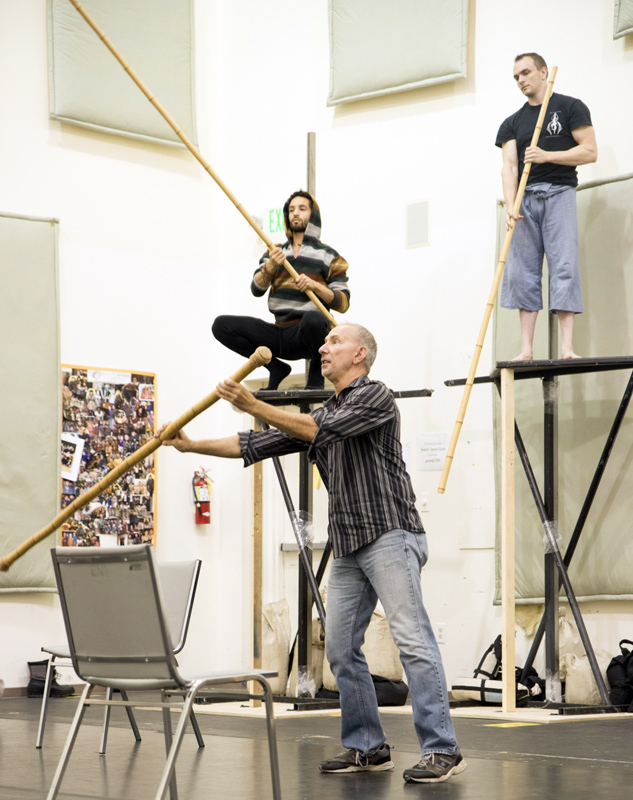 He’s really an expert in the score of The Pearl Fishers, he’s done it many times. And has an innate understanding of French music. Yes, he’s French, so you feel that should be the case; but it’s not always. Emmanuel really works beautifully with singers, he works beautifully with the orchestra, and this music is in his blood. I know everyone already in rehearsal has loved working with him. So we’ve got a very happy team, putting this show together! The Pearl Fishers may be set in Ceylon; but this opera is as French as can be. Can you explain what’s so French about it? Yes, this is a quintessentially French opera. There’s a wonderful saying by Noël Coward about Carmen; he said, “The Carmen of Bizet Is about as Spanish as the Champs-Élysée.” [Say it with a British accent and it rhymes!] And what he meant by that was that Carmen is essentially a French work, not a Spanish work, and the same applies to this, albeit not about Spain. This is not about Ceylon, or Sri Lanka, as we call it today. French society in the middle of the nineteenth-century was quite straitlaced. But of course we all know, from Traviata, that men had mistresses on the side, courtesans, etc. There was this duality between proper married family status and, expressed in art, repressed emotions and desires and longings and sensuality. So in the second half of the nineteenth century there arose a school which we saw in art, in music, called orientalism. It’s allied with travellers going east, especially to Asia, to Japan and China, but also coupled with what I would term a patronizing attitude to the east. In other words it was deemed fascinating to put the east onstage, or in art; but there was an underlying assumption that western culture, western society, was inherently more ordered and moral. Now, in the mix of the hypocrisy I mentioned, this school of thought provided license, to a very proper society, to put sensuality onstage: it was okay because it wasn’t here, in Paris. It was somewhere else. Sensuality, inherent in the work and the music, is given license by its setting. Now, The Pearl Fishers I think doesn’t fit into that school of orientalism, because this piece is not about Ceylon. Bizet wasn’t writing a piece about the conflict between east and west, which you see in Lakmé, for example, set in imperial India. Probably the best parallel to today would be the way we put sci-fi onstage, or modern fantasy. To get that sense of something different, something otherworldly. And what our production does is capture that element of the fantastic by not putting realistic scenery or costumes onstage, but instead giving us a stylized version. An example of how French it is, for me, comes with the hymn to Brahma at the end of Acts 1 and 2, where in fact, Bizet rehashed music from a Te Deum. For Seattle Opera's 2009 The Pearl Fishers, Gerard Schwarz conducted the chorus and orchestra of Seattle Opera. It’s is about as Eastern as the music you’d hear in Nôtre Dame cathedral. There’s no pretense at making Ceylonese music in any way, shape, or form. This is French music, expressing that quintessentially French fusion of religion with desire: a chaste priestess, being longed after by two men. I don’t think we take it seriously. It would be more shocking if she were a nun in a Catholic church. Bizet didn’t want to go there; that would be dangerous. This way, it’s safe, and yet provides a frisson of this little battle between desire and propriety. Bizet never had much success while he was alive, and because of his early death we have no idea what else he might have accomplished. How would you describe his legacy? The Pearl Fishers is an early piece which actually was very successful with its audiences but not with its critics, with the glorious exception of Berlioz, who saw its virtues, especially orchestrally. And Carmen of course wasn’t a success, because it was daring and original and it was put in the wrong theater. And then Bizet died. In a way he was ahead of his time. For a young man, he writes music not only of incredible beauty but also fluidity and harmonic daring. When I listen to The Pearl Fishers I find little harmonic twists which flick me to moments in Carmen. Sometimes critics are unforgiving of young people when they write a clearly impressive piece. Bizet was only 24 when he wrote this. He wasn’t around long enough to create a huge volume of works. His originality may have held him back. And of course he was criticized for being under the influence of Wagner, which I think was unfair. He was misunderstood. And yet he was his own voice, and one of the great composers of opera, albeit with a small output. I think his early death is a tragedy for the art form, because he would have gone on to great things. Melody is a really, really important part of The Pearl Fishers. ‘Beauty’ is the key word for this score; there’s a lyricism, an unending use of melody, which makes the evening just fly past, in musical terms. There’s a gorgeous tenor aria for Nadir; “Comme autrefois,” the beautiful aria for Leïla; even Zurga’s monologue in Act Three has great tenderness. It puzzles me, how the piece got written off as being rather second-rate for many years. Yes, its plot is slightly formulaic. But the characterization is very interesting. It doesn’t have a big cast list—essentially it’s about three people, who must sustain the entire drama. And yet there’s real nuance to the idea of friendship and the betrayal of friendship; the longing, bordering on obsession, for this unattainable vision of beauty these guys have shared and have then rejected, resolved not to compromise their friendship. Psychologically, it’s actually a very sophisticated setup. 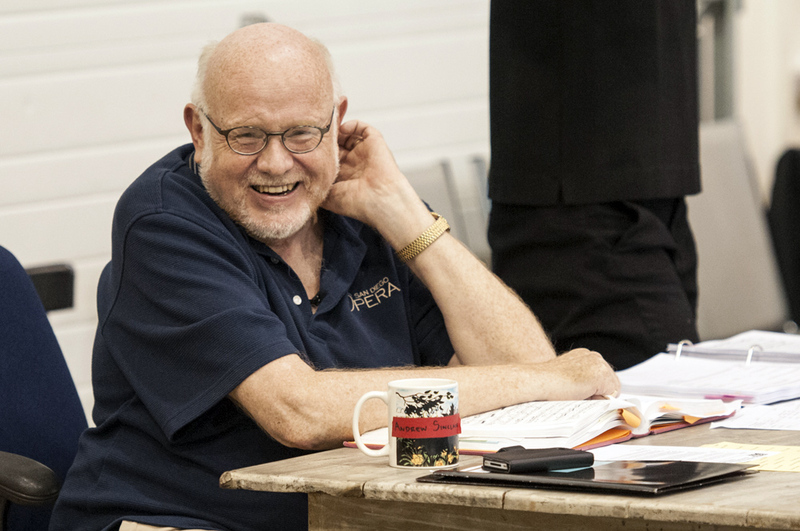 Andrew Sinclair was telling me in rehearsals he’s been really delighted the singers are bringing nuance and complexity to their characters. Think about that whole situation: it’s more than black and white, it exists in a shade of grey. It’s a much more subtle piece than it was given credit for. And of course we have two casts, and Andrew was saying already there are differences between those two casts. The Pearl Fishers’ ‘Friendship’ duet is only one of many such duets in French opera. Why is this piece so popular? With the famous duet—known around the world as “The Pearl Fishers duet”—we have one of the great hit tunes of the entire repertoire. William Burden and Brett Polegato sang The Pearl Fishers' Duet at Seattle Opera in 2014, with Carlo Montanaro conducting the chorus and orchestra of Seattle Opera. But what interests me about its use in the opera is how the melody comes back as what the French call an idée fixe, an obsession. So when the thought of the friendship or the pact emerges, you’ll hear that tune, or just a small part of it, in the orchestra, often just in the flute. It’s a Wagnerian technique, which may have been a source of its criticism. It’s a subtle technique which reminds us of the dramatic idea without requiring the singers to sing the melody again, as might have been done in lesser hands: you know, “Here’s the big tune, let’s milk it for all it’s worth!” Bizet’s is a more delicate approach. The tune is so strong, I’m sure Bizet’s audiences went wild when they heard it. The opera hinges on this male friendship, rather than hinging on a relationship between a man and a woman, normally the tenor and the soprano. Of course the soprano is in the mix there, but it’s an interesting re-alignment; male friendship is valued as highly, if not given a more elevated status, than the conventional male-female love relationship. That’s certainly not the model of standard Italian opera, and it gives this opera its particular tone. Pearl fishing is actually a very dangerous act: people die. That’s why they need continual votive prayers going on for their safety. So underpinning this piece, which as I said is very delicate, there’s this macho element: the men are out there getting the pearls, doing their job to provide for their community. And Nadir is a hunter, you know, going out to bring the food back to the village. Italian operas aren’t built on this kind of male bonding; they are built on hetereosexual attraction. Again, maybe this is why The Pearl Fishers lost popularity for a while. It is unconventional in that respect. Tell us a little about the two casts you’ve assembled for this production. We have a number of debutants in this production. Maureen McKay, who’s singing Leïla, and Elizabeth Zharoff, who’s our alternate cast Leïla, are both making Seattle Opera debuts, although both have local connections: Maureen was a Young Artist here, from 2004 through 2006, and Elizabeth was born in Wenatchee, so two nice little homecomings in our two Leïlas. Our two Nadirs are John Tessier, last with us in the Zandra Rhodes Magic Flute and in Fidelio; and Anthony Kalil, making his debut. We have two baritones singing Zurga: Brett Polegato is no stranger to our stage, and Keith Phares was one of the Marcellos in Bohème a few years ago. And our two Nourabads, Jonathan Lemalu and Joo Won Kang, are both making debuts. Jonathan of course I know, not only from New Zealand, but actually I’ve known him for many years indeed when he was just starting out, when he did a wonderful recital for me when I ran the Buxton Festival in 2000. He’s an artist I’ve really enjoyed seeing develop over the years, so it’s very nice to feature him in this production. So it’s a small cast, but we’ve really got two super groups of singers lined up for you, regardless of which night you choose to attend.